Home should be where we feel the most nurtured and in control. However that is not always the case with too many papers coming in, too many toys and too little time. Follow these 10 tips to make a difference and create an organized home. Start with a place for everything and everything in its place. Every item in your home should have a home. Set a timer to declutter. Just 15 minutes makes a difference! Set a time each evening for the 7 minute sprint. During this time, your family gets everything back to where it goes and everyone works together. Establish a paper command center with your calendar, slots for paper (action, pay, file) and a bulletin board for invitations and reminders. Set a time weekly for your admin time to go through and work through your papers. Lists make a difference in keeping clutter out of your head. Keep your list in a notebook in categories. Go back and prioritize what’s on the list before starting to tackle it. Decide on 3 Most Important Tasks to get knocked out early in the day. Create routines for each day to conquer the regular stuff like laundry and dinner. Decide if you are doing one load daily of laundry or assigning days to colors of laundry. Make dinner early in the day with a crockpot or do a series of dinners on Sunday. Routines should fit your personal style. Host a family meeting weekly to communication and collaborate. At the meeting write in activities on the family calendar, talk about upcoming events and have some family fun! Ask for help! Whether it is clearing the table or cleaning the toilets, ask your family to be a part of the organizing and cleaning. Post a chart with everyone’s responsibilities, including deadlines. Once a season, set a Saturday to do a little catch up. Busy families need a day to restore order in their homes, in their closet, and in their pantries. Share your tip for home organizing too! So much to do and so little time to do it all! It is no wonder we feel drained, unproductive and overwhelmed at work. Follow these 10 tips to make a difference in your efficiency and effectiveness at work. Choose a planner that works for you. It can be as simple as a spiral notebook or a Google calendar. Having one place to consolidate dates makes it easy to keep up with activities, projects and tasks. Use lists. Consolidate your list in one spot. Making the list is the first step, prioritizing your activities is the next step. Set your day’s priorities the night before. When you come in to work and you know your focus, you get started right away. Choose 3 Most Important Tasks and get these done early in the day. Every day is filled with distractions and interruptions. Getting the most important tasks done early helps you feel productive! Establish times to work hard. Have a power period in the morning and the afternoon. These are times where you just work on one project. Turn off all distractions, including your cell phone, email, and post a note on the door for your colleagues, to keep this time sacred. Keep your action items in a desktop sorter in files. Finding papers you need to work on saves time and energy. Delegate lower level tasks to an assistant. Know what is worth your time and what is less important. Set up a process for your assistant to check back in with a time line and specific deliverables. Take a break during the day to eat, walk a little and get refreshed. You will work better with brain food. You may think you have too much to do, but a break will help you be more efficient. Set specific times for email. Do an email triage, with a quick scan and filing, and then consolidate projects and tasks on your list to work on during your power period. Set a time to end your day. It’s important to get out of your office and connect with others too. What are your tips for time management at work? The world is a crazy place right now! Every day we are faced with mini emergencies that make our lives a little more difficult. Follow these ten tips for those “just in case” situations. Know your options for a flat tire. Have the phone number for roadside assistance handy in your cell phone. Place a key and a back up key outside your home in a hidden spot. In case you need one and forget to replace it, you have a spare. Make an extra car key and keep it in your purse or wallet just in case. Keep flashlights with batteries ready to go, consolidated in a basket in your laundry room. No power at the last minute is not a problem. Add the In Case of Emergency (ICE) contact to your cell phone. Use an ! in front of the contact in addition too so it will be easy to find in your contacts. Keep a list of email, cell phone and home phone numbers of your family in your wallet, cell phone or Evernote. Purchase an extra cell phone charger for your car and to travel. Being out of power means being out of touch. Make a list of all the medications and all the allergies of family members. Store this in your cell phone notes under Medical Information. You will have this with you in case you are headed to the emergency room. Keep emergency medical telephone numbers such as doctors, poison control, veteranarians, and rescue personnel in your cell phone or posted by your telephone. Be in touch throughout the day to know your family’ plans. Know where your spouse, kids and parents will be throughout the day. Teach your kids your cell phone and their grandparents cell phone numbers. They will be able to contact someone just in case. What is your tip… just in case? May is National Move Month! Though you may be excited about moving to a new place, you may not be looking forward to the move itself. Organization will help you get through it. Declutter first. Go room by room and eliminate what you have not used, what’s broken and what’s trash. It saves you money to have less to move. Donate the items you don’t want to the local Goodwill or have a garage sale to make some extra money for your move. Remember, what may be trash to you may be someone else’s treasure. Take inventory. Create a spreadsheet to list your items. Specify which room will be used for what use. Assign furniture to the room for use and storage. As items are packed and unpacked, you will be sure all your items arrive and are placed appropriately. This is also valuable information for your home owner’s or renter’s insurance. Start packing early. Pack by room or by use. It will take longer than you think to get all the odds and ends as well as the big items packed safely. Pack a “last out, first in” bag. It can be packed in overnight bags and kept apart from items going on the moving truck. Label everything. Yes, everything! Label the box on 3 sides, including the top. Write what the room is and what the items in the box are. Have plenty of sharpies or colored tape to write this on the boxes. Use plastic bins. Bins can be reused once you are in your home or office for other storage as well. This is especially helpful for seasonal decorations. Purchase the bins with lids, pack your seasonal items in those and then stack in the garage without worrying about the elements ruining everything. Update your address. Start early with letting other’s know your new address by email. Organize your papers and bills. You may have 2 sets of bills and papers when you move for a short time. It’s a perfect time to update your online bill paying system with new account numbers and addresses. Research and choose a well established moving company. Review online reviews to be sure you have a reputable company to move. Find a company that fits your budget and your move date. Work as a team. Write a list of all the tasks related to your move and divide up the responsibilities with your family. Check in each evening to check off what has been accomplished. Get plenty of rest and take care of yourself. A move is hard work! Getting a good night’s sleep is important for your best self. Getting organized for a move makes all the details fall into place! Our students have a lot on their plates! There is homework, sports, homecoming, church and more! Time management is an important skill for them to develop early on to be sure they feel successful academically and personally. Follow these tips to help you do your best! Write in your assignments in your planner in each class. Check your teachers’ websites to be sure you have all your assignments too. Check your planner each afternoon, write in what you missed. Review your out of school activities and write these in your planner. Prioritize and plan the week out. What is most important to do on what day? Anticipate the next test. Plan your week by working around existing activities. Wednesdays are especially busy! Break big projects into baby steps. For example, flashcards written, study for short periods, review with someone. 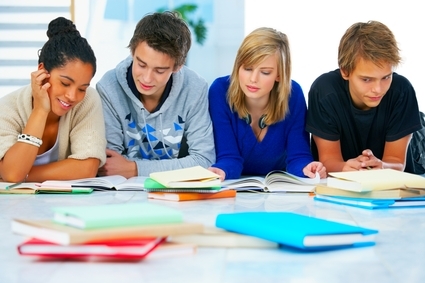 Get started and work hard during homework time, from 6 – 9 pm. Take breaks when your concentration stops, but get back to work in 5 minutes. Pack your backpack and your homework before bed. Wind down and get in bed by 10 pm. A good night’s rest makes all the difference. Take Back Your Life Now! … by the Sea! Includes: all workshop materials as well as breakfast and lunch Saturday, afternoon snacks and breakfast Sunday. Register with Ellen or Debbie. https://professional-organizer.com/WordPress/wp-content/uploads/2016/07/logo.png 0 0 Ellen https://professional-organizer.com/WordPress/wp-content/uploads/2016/07/logo.png Ellen2012-10-11 15:49:592012-10-13 15:50:10Take Back Your Life Now...by the Sea! "Nourish to Flourish"
During the holidays, we add on to our already full plate with an oversized portion of mashed potatoes and holiday responsibilities! We are adding more tasks and time commitments with the holiday season. To ease the stress, let’s take a long term perspective by spreading out the time for planning and preparation. A time line helps us add in holiday activities while not overwhelming us. 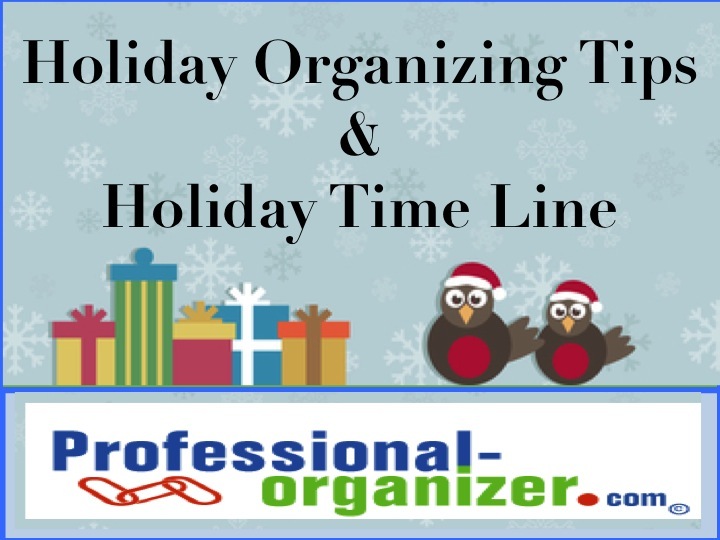 Follow these holiday organizing tips in a week by week time line to help you get organized for your best holiday yet. This year Chanukah begins at the end of November. Move all these dates up 2 weeks to be ready for your celebration. Assess your family budget for the holidays. Include actual costs from the previous year for cards, entertainment and gifts. Establish a budget that will work for your family. Compile your gift list. Set up family gift swaps and share names with those who are swapping. Make a list of what you have already purchased throughout the year and match that with gift recipients for the holiday. Celebrate Halloween and enjoy some pumpkin treats! Host a family meeting to talk about each person’s priorities for the holiday season. Write a list including one favorite activity of each family member for the holiday season. Be sure to include a volunteer activity to help others during the season. Ask how everyone can work together decorating, writing cards, wrapping gifts or cooking throughout the holiday season. Post your helpers names and jobs on a chart in the kitchen to remind everyone. Post a holiday calendar with dates of family activities and commitments during the holidays. Add to the calendar as new dates come in. Create your holiday music play list on Pandora with help from your family. Now’s the time to purchase air travel and make hotel reservations for holidays away from home. Write holiday card addresses, stuff and stamp envelopes so they are ready to mail on December 1. Holiday shopping trip #1. Be sure to shop for items that need to be mailed. Purchase gift wrap, paper goods, batteries and other supplies for the season. Enjoy holiday marketplaces. Purchase stocking stuffers and hostess gifts. Finalize Thanksgiving menu and share cooking with family members and friends. Pull out your holiday decorations and begin decorating your home and office. Set a time for your family to decorate together with holiday music and festive simple snacks. Bake and freeze breads and bar cookies for later to share at parties. Set up your gift wrap station to wrap as you go. Holiday shopping trip #2. Online shopping can save time and money too. Be sure to stay true to your list and your budget. 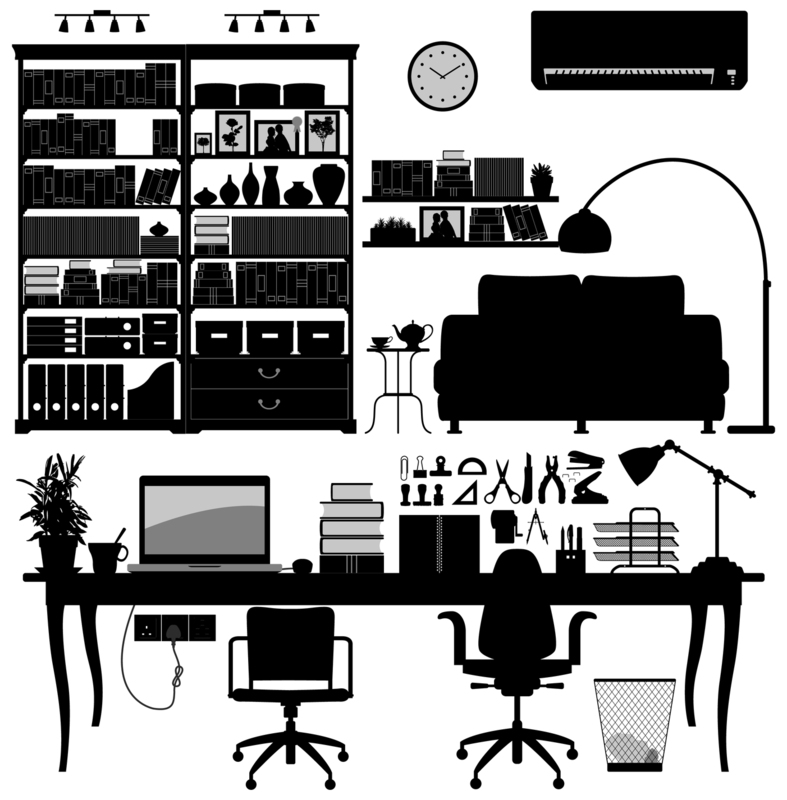 Complete decorating your home and office. Purchase your live tree or visit a Christmas tree farm to cut down your tree. Host a family meeting to keep on track with family fun and responsibilities. Holiday shopping trip #3. Make this final trip just in case your list was not complete. Mail gift items by December 10. This was your gifts arrive early. Happy Chanukah! Celebrate with friends sharing all faiths with some easy store bought desserts. Holiday gatherings are in full swing! Enjoy the festivities with friends and colleagues. Charge batteries for recorders and more. Decide where you will be attending services Christmas Eve. Finalize holiday plans. Set your menu and share responsibilities for family gatherings. Wishing everyone a delightful and festive holiday season! Email overload is taking over paper overload! The email tsunami and electronic technology can overwhelm and paralyze you. Use one of these tips to help you make a difference during your computer time. Synchronize all your technology using IMAP. With this system, you can add and delete information on one machine and all machines will be updated. Not sure what to do, get a great technology person to assist. Be sure all your spam filters are up to date. Nothing is worse than having to delete, delete, delete. Be sure you are backing up with Carbonite. It is not if but when your computer will crash. Be deliberate about your email, reading and list servs. Process your email 3 times a day. Have your reading come to a separate area with an RSS feed. Stay on only the list servs that make a difference in your work. Have a file folder for processed email. It can be just one folder, just so you can slide completed email in there and out of your inbox. Color code your really important email. Email from a boss, your most important client, or your family should stand out so that you can find it easily. Remember, the more email you send the more you receive. Pick up the phone when you are ready to finalize a date, a contract, or a meeting. It will save you time and energy. What are your email and technology organizing tips?